The New York Sun published an article, Summer Antiques Fairs – and Finds, about the summer antiques scene in the city. Condensed version: there's not much of one. Most wealthy collectors are in the Hamptons, and smart dealers follow them. You'll find them in places like the East Hampton Antiques Show (earlier in July) and Antiques & Design in the Hamptons, August 15 – 17. One of the only major fairs scheduled in the city is The New York Antique Jewelry & Watch Show, which starts today at the Metropolitan Pavilion. The Sun quotes Neil Marrs, a New York dealer who specializes in collectible jewelry from the '60s and '70s, as saying that this an opportunity for collectors to buy "fantastic stuff" at wholesale — not retail — prices. "My colleagues and I all sell to the big department stores and boutiques up and down Madison Avenue. If some lady shows up with her husband and she wants a golden-diamond bracelet from the '50s, she can go to Bergdorf Goodman or she can go to this show and save $20,000." The Brimfield Antiques Show: ready for a road trip? It started on Wednesday so who knows? Maybe all the good stuff is already gone! But it's just Thursday, so look around, see if you can rent a Zipcar, and hit the road going north. 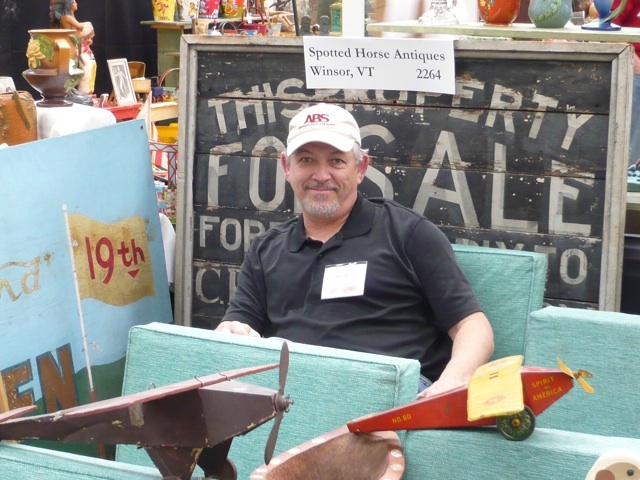 The Brimfield Antiques Show, "ground zero for the entire trade" according to the Antiques Trader, is happening all weekend. Big? 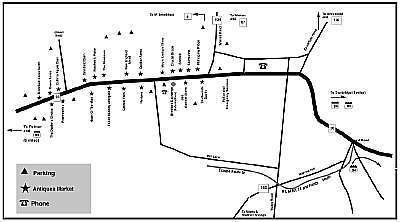 Look at this map below. All those little stars are seperate antiques shows with multiple dealers. One of my favorite memories is driving up and staying at a B&B, walking all day through the market, and then swimming that evening in a Massachussets lake. 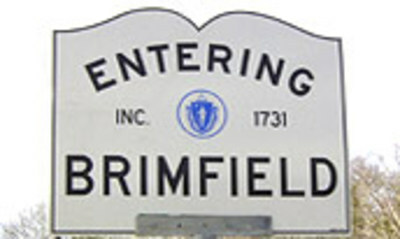 It might be a little early for a swim, and a little late to book a B&B, but luckily for us all, Brimfield is held three times a year. Who knew? 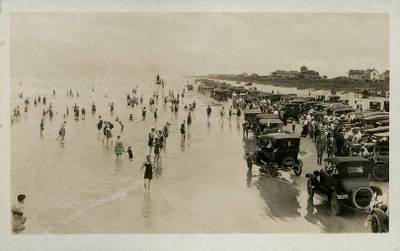 Manhattan has a vintage postcard club. I always say that's the great thing about New York City: whatever you're into, there's a like-minded group you can join. Check out the site of the Metropolitan Postcard Club of New York City–it's informative and those postcards sure are pretty. The club is hosting the Spring International Postcard Show this weekend at the Hotel New Yorker (34th st. at 8th Ave). It's Friday 12-7:30, Saturday 10-6, and Sunday 11-4:30. Admission is $7-10. Also up, the The International Fine Art Fair. Check shows and fairs for details. Just ran across this one in the New York Times: Pascoe & Company, who appear to specialize in Moorcraft Pottery, is holding a New York Collectors Weekend at the Omni Berkshire Hotel, 21 East 52nd Street. The advertisement in the Times bills it as a British Art Pottery Exhibition and Sale, including artist demonstrations, master classes, and lectures by a UK historian. It starts today, 5–7 pm, and continues Saturday, 10–5, and Sunday, 10–4. Admission is free. With cherished memories of past Stella Show Management's two-weekend, Triple Pier Antiques Show, I arrived at Pier 94 Sunday sure that the one weekend, one pier show spelled the end of the antiques trade. I was wrong. The March 15–16 Pier Antiques Show was as good as, if not better than, previous shows. Ah, the good old days, when Stella Show Management's Pier Antiques Show was the TRIPLE Pier Antiques Show. Things were so hopping, the show was held on two weekends in a row. Two weekends, three piers–hey, that's six piers, really. Well, it's smaller now. One weekend, one pier (Pier 94). This year they're trying a pink tag sale, where dealers will hang a pink tag on items cheaper than $300. I'll be curious to see how this plays out. I can imagine that in a booth with very high-priced items, one or two tagged items might lure in the faint-hearted. But what about a booth with a number of collectibles priced under $300. Will it look silly? Desperate? Or merely affordable? Also up this weekend, in time for Asian Arts Week, the International Asian Art Fair at the Park Avenue Armory. Check the Shows+Fairs page for details. I was walking down West 18th Street Friday night, and passed The American Antiques Show and Antiques Manhattan, when I saw a sign for . 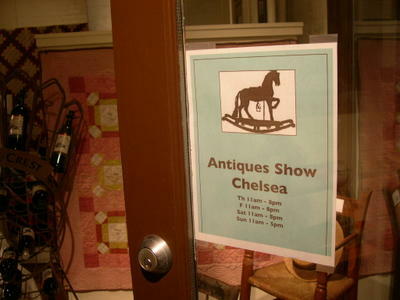 . . Antiques Show Chelsea? How had I missed that? Inside I found Phyllis Sauter, a Pennsylvania Americana dealer, wrestling with a wine bottle opener and getting ready to siphon passing buyers from the big name shows next door. A friend owns the space, so Phyllis can set up shop without paying huge exhibition fees. Stealth dealing. Gotta love that.